“Add a pop of color” is design advice that just about everyone has heard. It’s likely that people reach for a throw, a pillow, a colorful rug or accessory when they need a bold accent. But how about adding a brightly hued piece of art for that burst of color? Choosing to use art accomplishes a few things at the same time: It injects some personality into a room, creates a conversation point and, of course, adds the color the space needs. Here are 10 types of artwork that will add just the right colorful element. This piece by light artist Chol-Hyun-Anh is an optical illusion. 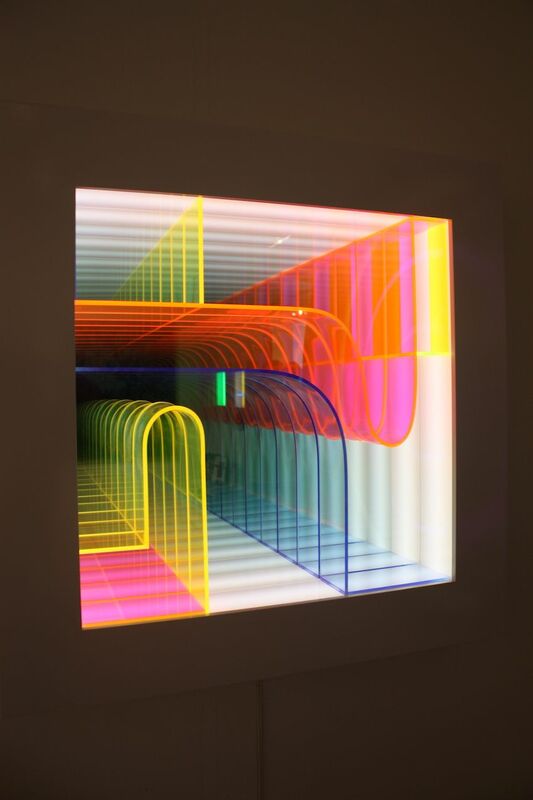 What looks like a deep window that reaches into infinity is actually a masterful construction of mirrors, light and neon plexiglass. The bright pieces inside are highlighted by the illuminated interior and really makes it stand out, especially in a darker room. This piece of art provides more than just the pop of color too. It can make a space look a little larger because of the depth inside. A large blank wall is ideal for a sizeable collage like this one by Daniele Sigalot. 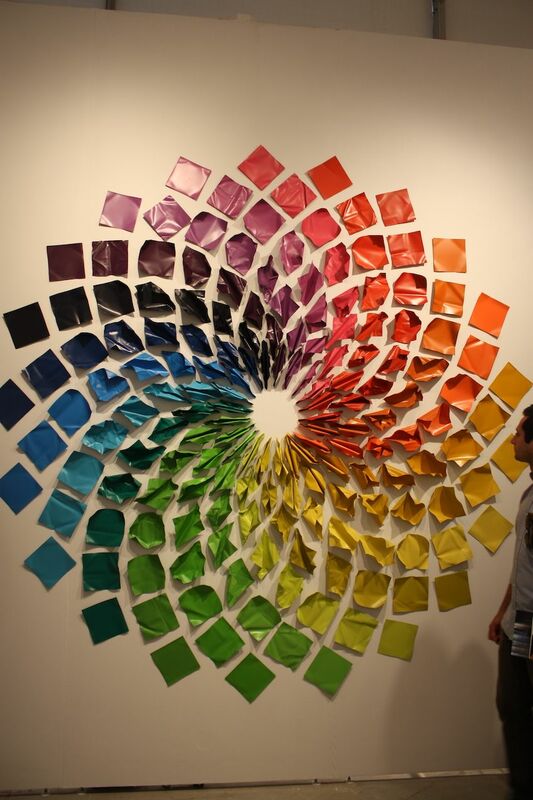 A full rainbow of colors is used in the symmetrical layout that is created from brightly hues pieces of painted aluminum. At the center, the pieces are folded and each successive round expands as it moves outward, adding a feeling of movement. This type of art is ideal for a neutral space or a modern room where all the colors of the rainbow can be the focal point. Monochrome works in bright hues do the trick. Multiple shades of one color can add extra impact when it comes to adding a pop of color. 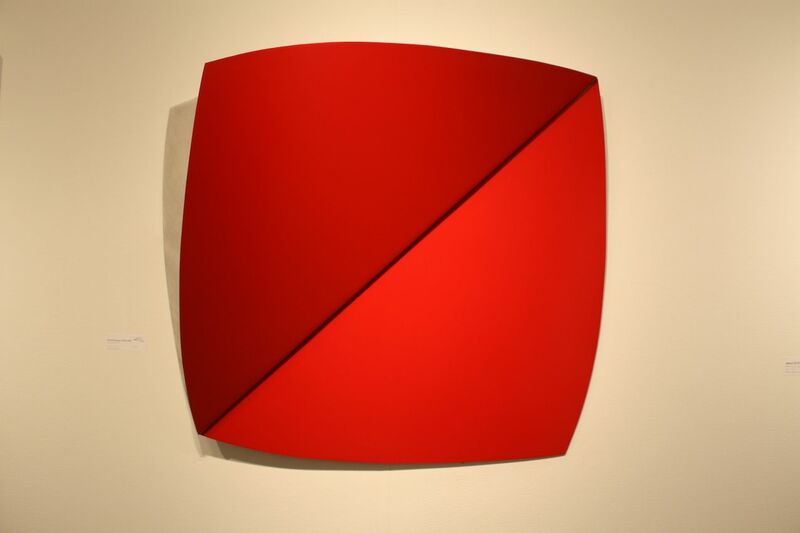 This wall art by David-Rodriguez-Caballero uses two shades of red to create depth and dimension in this sculptural work made from metal. It’s a workable sized piece that can be added to any space that needs an accent. Colorful multimedia artworks can have amplified impact. Quite obviously this portrait includes a range of bright colors, but the depth that comes from the added dimension really makes them pop. Artworks that use multiple media can have an extra impact because not only do they include painted hues, many of the bright colors come with extra texture or depth. Even the plain silver background, highlighted by textural shapes, makes the rest of the image stand out even more. Unconventional canvas shapes add impact. 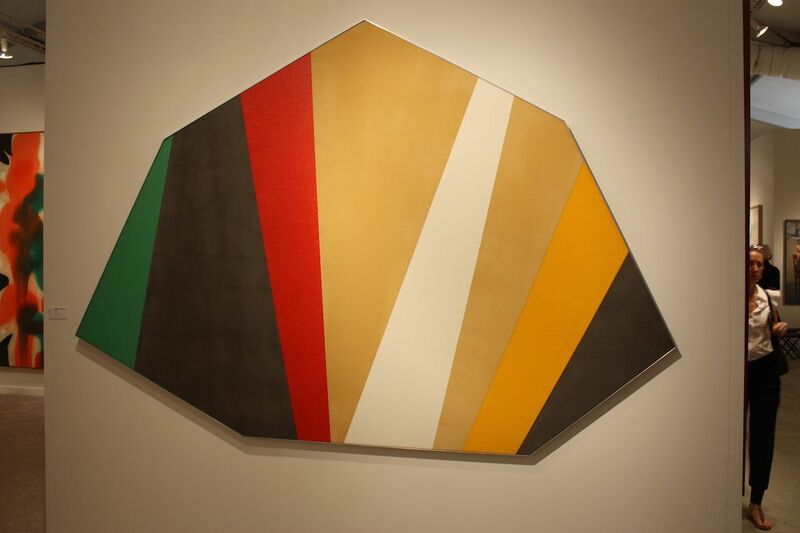 Besides incorporating bold colors, this work by Kenneth Noland also has an unexpected shape that’s not symmetrical. The unusual outline draws more attention to the piece and the neutrals really make the red and green sections stand out. Noland was known as one of the first practitioners of Color Field painting and a pioneer in using oddly shaped canvases. This style of art adds a huge focal point to a room without overwhelming the space with colors. Round artworks are also a different choice. Round shapes aren’t just for mirrors. 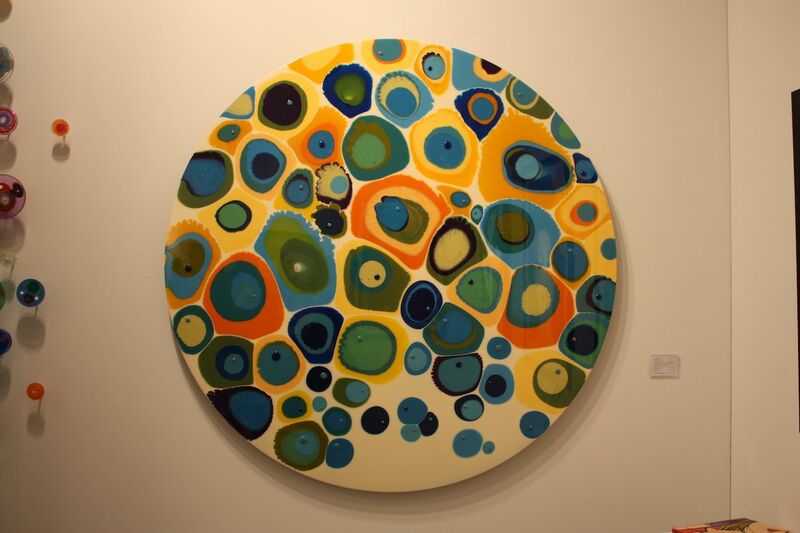 Colorful art pieces can also be found in round shapes, like this one called Fructose by Klari Reis. 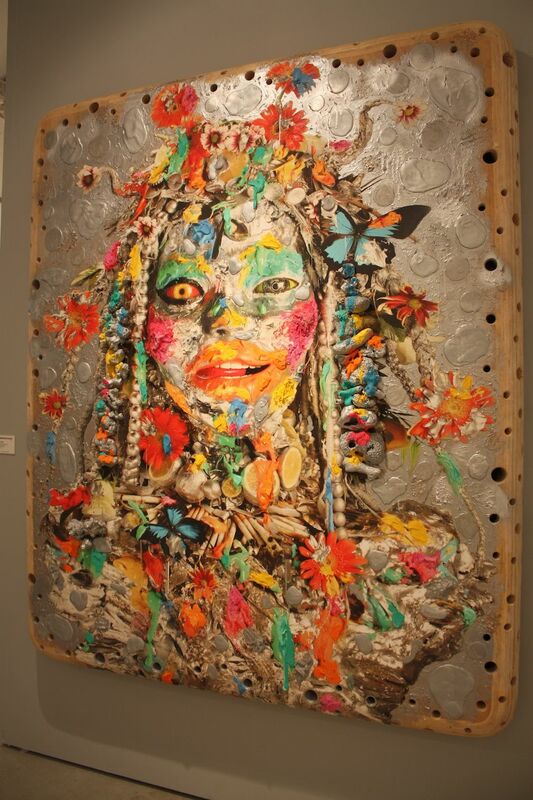 A floating aluminum panel is embellished with mixed media and an epoxy polymer, which creates a kind of enameled appearance. The colors are predominantly blue and green but are accented with bright citrus hues that are sunny and happy. True to the name of the piece, it makes you think of something fruity. Adding a pop of color to a space is the perfect time to have some real fun. 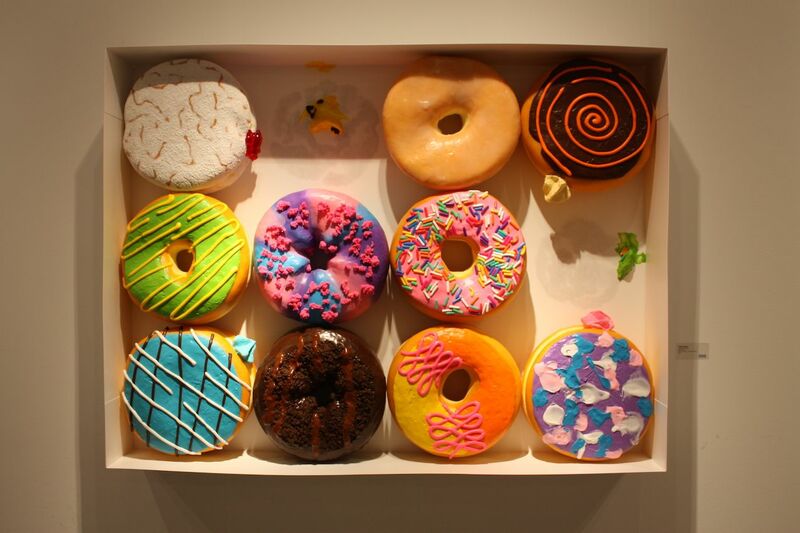 Artworks that render food in creative ways are a great idea for whimsical decor. Artist Peter Anton plays with color and scale in creating his pieces that are so deliciously sugary looking. His box of “Celebration Donuts” puts these American treats on display, complete with the frosting smudges left behind from already eaten treats. Cartoon-based art is naturally colorful. Cartoon-based art is naturally colorful and can be a real conversation starter. 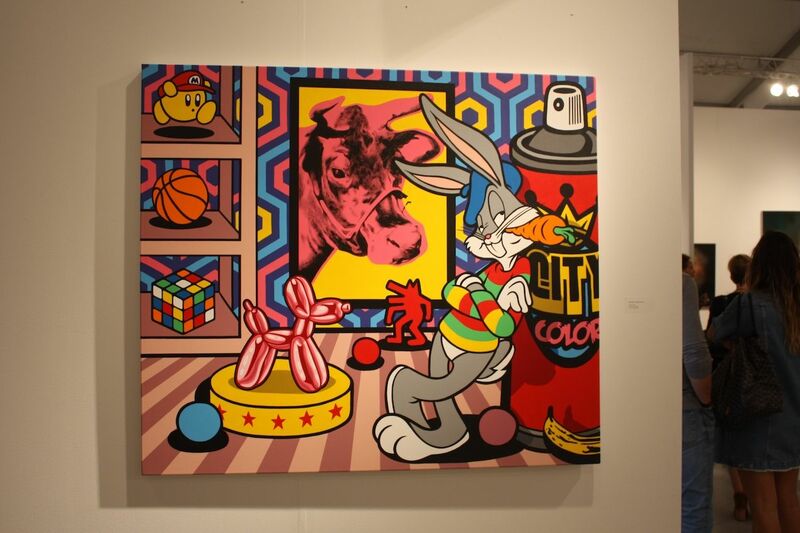 This work by Speedy Graphito combines a cartoon character with pop culture icons rendered in a cartoon-like fashion, including the Jeff Koons balloon dog sculpture and a Rubik’s cube. The piece includes just about every color of the rainbow and will brighten any style of room. Diptychs can double the visual impact of a piece. Choosing a bright diptych — a unified artwork that consists of two panels — adds a large dose of color. 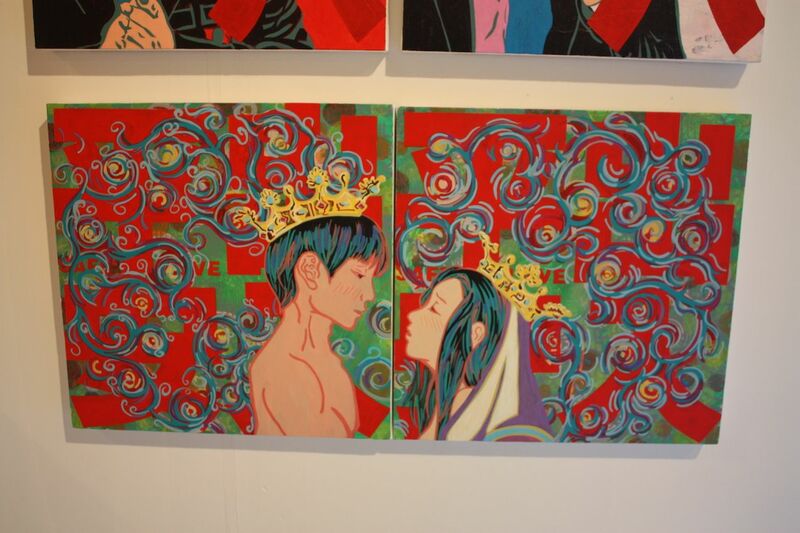 This painting by Yim On Tse is a good example of wall art that has double the color impact. There’s something about one image being divided into two sections that visually magnifies its power. It doesn’t necessarily have anything to do with the size of the overall piece, so this style of colorful work could be used in any room. Abstract artwork is a common choice for adding color to a room. Abstract art pieces take many shapes and forms, but many are vibrant and ideal for adding a pop of color to a room. 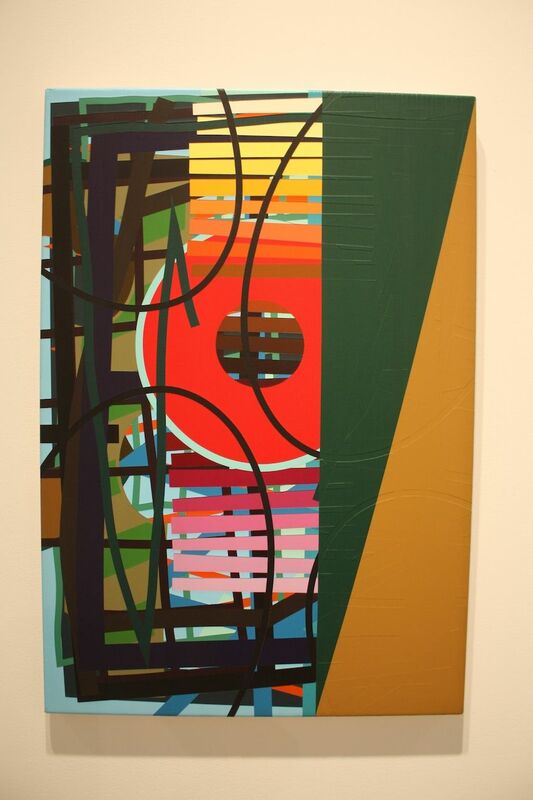 Some include geometrical elements, like this painting by Zigi Ben-Haim. The large swaths of earthy hues are a perfect base for highlighting the bright red circle and colored shapes. For fans or abstract art, it’s easy to find brightly hued pieces that are appropriate for a particular space. So, next time a space needs a pop of color, survey the walls and see where a colorful piece of art can be added to totally transform the room. The post 10 Ideas for Using Artwork to Add a Pop of Color to Your Space appeared first on Home Decorating Trends – Homedit.